A couple of months ago, I picked up the November/December ’07 edition of Disney’s Family Fun magazine at the library. One of the pages I copied before returning the magazine had instructions for making the leg of a pair of woman’s tights into a snake-shaped draft blocker (you know, those long skinny things you put at the base of a door or window to keep the drafts from coming in?). My husband had a great draft blocker made to look kind of like a dragon that his sister made years ago, and I had ordered another one so we could battle drafts at both the back and front doors. So we didn’t really need another one, but the Family Fun project had fun, zany stripes, and I thought it would make a fun gift someday. Into my bulging idea files it went. This was such a simple project, and so different from anything I had ever made before. Instead of filling the sock with rice (as you might do to make a draft blocker), I used polyester fiberfill to make a lightweight, soft stuffed animal. Also, instead of forming a neatly tapered snake tail at the end of the sock, I just kind of folded it over and hand-sewed it into a straight line. Seamstress, I am not! I decided I wasn’t sewing for a very critical audience, so I didn’t concern myself too much with this detail. Our unique snakes have square tails! The magazine suggested gluing on googly eyes, but I know that in my household, nothing stays glued down to any surface for long. I decided to sew on button eyes instead, and then followed the directions for sewing on the snake’s tongue. Katy woke up from her nap as I was finishing the first stuffed snake, and wanted to hold him immediately. I hurried to make a second snake for Bayla before she woke up. She liked it fine, but started carrying around the draft blocker my sister-in-law made with greater affection. It was Katy who must have said thirty times, “Mommy, I LOVE my snake!” Going out on a limb to try making a stuffed animal paid off in Katy’s appreciation. Four days have passed, and she still carries the snake around and tells me she loves it. Maybe I have a future in making stuffed animals. Well, probably not, but this was a fun and easy little project to try! We’ve been snow- and fever-bound for the past couple of days, so I’ve been trying to find at least one novel thing to do with the girls each day to avoid the “stir-crazies.” Yesterday, I brought a wooden Noah’s Ark up from the basement that my mother-in-law got me for Christmas two years ago. After such a long time, I finally put it together. I’m not much of a handywoman, so I felt triumphant once I had the 16 screws in, and it looked like an ark. The toy was a hit, especially with Bayla, who loves all the wooden animals (two of each, of course). 1. Books: Hands-down, the most favored battery-free “toy” for the girls is a good book! I love nothing more than Bayla coming up to me with a book, saying, “You read this?” How can I resist? Both girls will sit on the sofa, turning the pages of books, intently looking at the pictures. Sometimes they will “tell the story” in their own words, using what they remember from the last time I read it and what they see in the illustrations. Literacy development at its best! 2. Puzzles: The girls have graduated to more complex puzzles with interlocking pieces, but they still enjoy playing with the “beginner” peg-puzzles with pieces shaped like animals or emergency vehicles. The more complex puzzles are a little rough at the start—they just want to sit and watch me putting them together until they get comfortable with the final picture; then they’ll give it a try themselves. Did I mention that I’m not a big fan of puzzles? So, I find this process a little irritating. But once they are willing to put them together on their own, I love watching their little expressions of concentration and then triumph. 3. Stuffed animals: Stuffed animals give the girls comfort and a chance for creativity. They each have four “lovies” they take to bed for naps and nighttime every day, and Bayla always “takes roll” to make sure she has everyone before falling asleep (“Where my friends? Roar, Bunny Rabbit, Monkey, Bear! Der it is!”) During the day, their animals dance, read, sing, and talk as part of their imaginative play. 4. Toy figures: Similarly, the girls play endlessly with little plastic figures they have accumulated with various toys over the years. They have Leap and Lily, Grandma and Grandpa, Kitty Cat, pirates, pilots, Pooh, Mickey…the list goes on and on. Some are used in conjunction with battery-powered toy houses; some take rides in Lightning McQueen slippers; some are lined up in front of kitchen toys for picnics and snacks. 5. 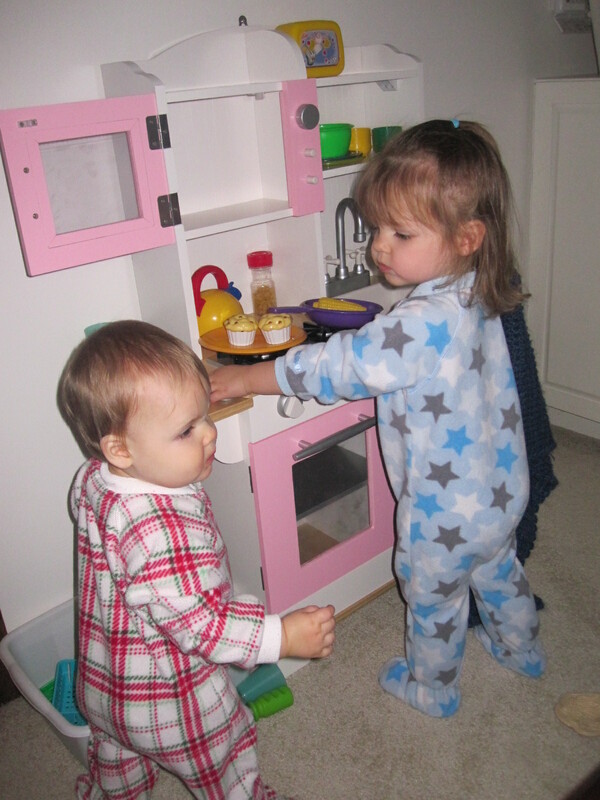 Kitchen toys: That brings me to another battery-free, imagination-rich toy: kitchen items. The girls have their own toy kitchen in the living room, and I found a big bag of foods, plates, bowls, cups, and spoons at a tag sale to use with it. They also love using oven mitts, washcloths, and dishtowels as part of their play, much of which happens around the coffee table, and not in the kitchen at all! 6. Bean bags: My mother made three little bean bags for the girls, and I put a masking tape “target” on the floor for bean bag toss games. The girls also balance the bean bags on their heads, shoulders, feet, and hands. Their favorite is crawling around with the bean bags on their backs, making sure the bags don’t fall off. 7. Chalk boards: The girls love to “chalk,” as they call it. It’s a dusty pastime, but it keeps them occupied and helps develop their drawing and writing. 8. Musical instruments: Admittedly, these are used in conjunction with CDs (which technically violates the “kid-powered” aspect of this list), but often the girls will march or run around the kitchen island with a maraca or a drum, singing songs or making up chants. 9. Blankets and pillows: The girls love to pull all the pillows off all of the sofas, and make a “pillow nest,” as Katy calls it. The blankets are great for endless games of peek-a-boo (still popular at age 3), which almost always leads into hide-and-seek, a new favorite. 10. Mommy and Daddy’s shoes: The girls are able to walk around the house with amazing balance in our giant-sized shoes. Bayla is forever bringing shoes into the family room to put on, never mind if they are covered in salt and snow from Daddy’s shoveling! 11. Hammers and other toy tools: No surface is safe! I am still trying to convince the girls that it is just as fun to hammer pillows and sofa cushions as it is to hammer wooden door frames. Michael found a spare square of wood in the basement to give them the satisfaction of a hard surface to hammer without damaging the walls! So that’s twelve ideas. And it’s only the beginning of the list I came up with! There’s also magnets, binoculars, doll clothes, balloons, Mr. Potato Head, blocks, pen and paper, play dough, Daddy's hats, tape measures, bubbles, balls, leaves, pinecones, snow…. My sister told me (only half-jokingly, I think) that she would become a Follower of my blog if I featured her in a post. She earned her place today with a creative act that trumps all others. It’s not her talent for writing, or painting, or public speaking, but the ultimate example of assemblage art: My sister and brother-in-law welcomed twin boys into the world this morning—little Nikhil Philip and Kiran Wayne. At 5 pounds 9 ounces and 6 pounds 15 ounces respectively, the boys seem to be doing well, though Kiran is getting a little extra supervision for his breathing in a transition room at the hospital. My sister has spent 37 weeks carrying two children inside of her body, giving them the safety and nutrition they needed to become residents of this world outside the womb. So, today, in this very brief post, I celebrate the greatest act of creativity of all: childbirth! Back in the year 2000, I bought my first copy of Somerset Studio magazine—the July/August “Tropical Paradise” issue. Before seeing that magazine, I had cut a few gift tags out of construction paper and made a few pretty Christmas cards with postage stamps using an idea from Better Homes and Gardens. But I had never imagined paper crafts as beautiful as what I saw in Somerset Studio. I became an avid reader, a subscriber, and even a contributor. My very first submissions to Somerset Studio were accepted—two entries into the March/April 2003 Call to Creativity to make Boxes of Remembrance using Janet Hofacker’s techniques for making boxes and shrines. I was so proud and excited to see my work in a professional publication. I was hooked! I submitted various pieces over the years; some were published, some were not. Somewhere around 2006 or 2007, though, month after month, effort after effort, resulted in rejection, and I got burned out on trying. I had found myself making things only to relate to a magazine theme rather than anything based on my own interests and ideas, and all that rejection took a toll on my creative self-esteem. I thought I would use today’s post to share with you some of my “favorite rejects.” While there is plenty of my work that I can look at now and say, “Really? You sent that in for consideration?”, there are a few pieces that I really liked and wished I could share with a broader audience. Now is my chance! This first photo shows a corner of the living room bookcase where I display some of the things I've made. The first "favorite reject" I will point out is Christmas piece in the back, with the decorated tags. It was inspired by Jennifer Hardy Williams' Canvas Prayer Board in Sharon Soneff's Faith Books and Spiritual Journaling. My next "favorite reject" is a bird house. Maybe bird houses got a little overdone; I don't know. I still love them! So that's a little tour of some of my "favorite rejects." I get to take advantage of the self-publishing aspect of blogging, and show you a little bit of my art and craft style in the process! Katy and Bayla came over to see what I was doing, and they were amazed. Their mommy was taking a white piece of paper and making kitty cats appear! Out of nothing! And so began a chorus of, “Draw another kitty here, Mommy!” “Draw one here, Mommy!” I happily obliged, feeling like a cat-drawing rock star with an instant fan club. No matter how much I may try to convince myself otherwise, I cannot deny the energy I get from others’ compliments and approval. Having that positive response from the girls gave me a boost that first day with my drawing book. Suddenly I was “a Mommy who draws.” They don’t know I’m not any good yet! My pictures looked like kitty cats to them, and that’s all that matters! P.S. : Here is a small gallery of some of Katy’s recent work. The third time's a charm! I considered starting an entirely new blog to cover up my poor blogging track record. But I decided to return to Drawing Near and keep my blogging history intact. The first time I tried blogging, in 2008, I had a newborn daughter and an ambition to blog daily with a different theme for each day of the week. In a word, crazy! 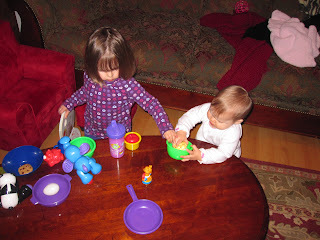 My second foray into the blogosphere came in 2009, when I had a toddler and a second newborn daughter. Though more realistic about my blogging schedule this time, I just couldn’t keep up my enthusiasm. I skipped a year and let both my girls get solidly into toddlerhood—they are now 2 and 3—and now I’m ready to try again. This time around I’m not doing a daily theme and I’m not focusing on updates on the girls. Instead, I’m interested in recording my efforts to revive and maintain my identity as a creative spirit in the midst of my roles as wife and mother. I don’t like to get too caught up in a narrow definition of what it means to be creative, so that if I don’t create an art journal page or work on a collage, I feel like I haven’t been “creative.” I want to recognize all forms of creativity in my life—planning activities with the girls each day; finding some new way to brighten the house or recharge its energy; figuring out how to organize the toys, papers, and other piles that seem to crop up everywhere; planning meals; thinking of some new food, activity, or craft to try. But beyond the everyday creativity required by parenting and “homemaking,” I also want to explore and describe my broadening interests in arts and crafts. If there’s one thing I love, it’s paper. And beads. And fabric. And paint. And pens. And books. And art journals. And collages. And decoupage. And altered objects. And polymer clay…You get the idea. What I lack in focus, I make up in variety! I have discovered by reading the words of many other blogging moms that I am certainly not alone in trying to enjoy my creative identity and share the fruits of a creative spirit with my children. I am hoping to use this blog to celebrate and explore my creative self.